As I write this, it’s early October. Here in the southern U.S. summer is still hanging on. But soon the hot weather will break and the cool fall temperatures will return. A signal that winter is just around the corner. And the holiday season. Thanksgiving is just weeks away. Now’s the time to start planning for that holiday. I want to help you get started with our Thanksgiving sermon outlines. My book, Sermon Outlines for Busy Pastors: Thanksgiving Sermons, contains 8 complete, multi-page Thanksgiving sermon outlines. This includes a 3 sermon series, giving you the opportunity to focus your church for the three weeks leading up to Thanksgiving. I also include a sermon based on Psalm 100:1-5 titled Unconditional Thanksgiving. When I prepared that sermon I had just returned from a mission trip to Uganda and Kenya. The Christians I met there and their commitment to Jesus in some dire circumstances made a huge impact on me and my view of Thanksgiving. That’s a special sermon and message for me. I invite you to take a look at Sermon Outlines for Busy Pastors: Thanksgiving Sermons and see the sermon titles and Scripture references. Get a head start on the holiday season today. P.S. 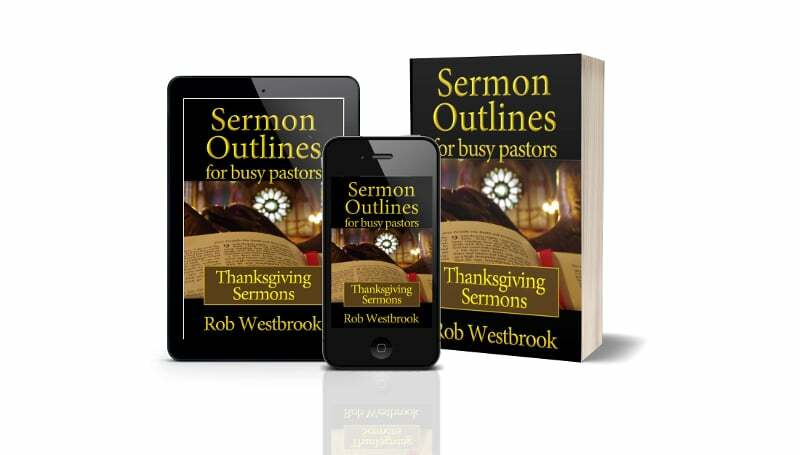 – These Thanksgiving sermon outlines are also included in my book Sermon Outlines for Busy Pastors: Holiday Box Set. The box set is a combination of my Easter sermon outlines, Mother’s Day sermon outlines, Father’s Day sermon outlines, and Christmas sermon outlines. That totals 60 complete holiday sermon outlines. It’s a great value. You may want to take a look.